Gibmiss: Penny Black Challenge 133 &Top Tip #17 - Anything Goes Challenge!! Penny Black Challenge 133 &Top Tip #17 - Anything Goes Challenge!! Love your fabulous cute card Sylvie. Hi sylvie, this is another very special card so gorgeous. This is an adorable card. Gorgeous colours and image and great embellishments. I love the layout - fantastic easel card. Lovely Card Sylvie! Love the papers! Gorgeous card, I love it! Thanks for joining us at Penny Black this week. 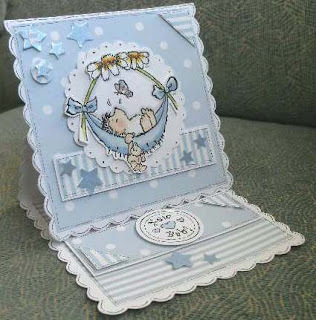 Such a pretty card Sylvie....love easel card too. What a gorgeous card I love this penny black image, the pink one is just as gorgeous. oh Sylvie, this is just adorable ... LOVE this wonderful easel card & how beautifully you've colored that sweet PB image. Gorgeous work !! !